Summary: ARSON GABLE FEELS LIKE A FREAK. HE CAN CREATE FIRE. HE NEVER ASKED FOR IT. HE NEVER WANTED IT. BUT HE CAN'T SHUT IT OFF. Before now, three things were true: he both loved and despised his grandmother; his life was going nowhere; and he was alone. But when a strange girl-who feels more normal behind a mask than inside her own skin-moves in next door, Arson hopes to find something he's never had: purpose. Using what he fears the most about himself, Arson must face his consuming past and confront the nightmare that is present as he walks the fine line between boy and monster. Dark, moody, and breathtakingly relevant, Arson, the chilling chronicle of an isolated boy with unimaginable ability, is sure to ignite the hearts and minds of a new generation. Sounds interesting, please enter me. I've heard this is great. Please enter me. I love the book cover and it sounds amazing. This one sounds really cool. I do have a US mailing add. I just saw a review on this book. Sounds good! intense! how awesome is that cover? Oh my, this looks eerie! I've been hearing GREAT things about this one! yes! i heard this was good! Please enter me for this one. The premise seems so interesting! OMG I want this one...so bad...looks fantastic. 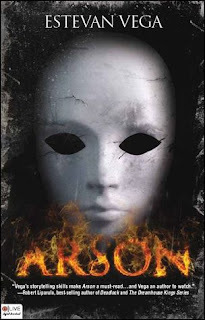 After having read Kari's review of Arson, I really want to read it for myself. Enter me please. I love the cover for this one! It sounds really good and the reviews for it are positive too! I love the cover, it kind of looks creepy! Please enter me for this one!! Please enter me! I would LOVE to read this! Sounds very intriguing. Please enter me. I can't wait to host him here in Raleigh in May!! Count me in! I really want this book!! This sounds very good. Please enter me in the contest. Oh wow this one sounds awesome, and that's a really creepy cover! I've never heard of this book before but it sounds great. I'd love to enter. Thanks so much for bringing these books to my attention through your contests and reviews. ive heard many things! me please! Sounds kind of creepy-my kind of book! Nice cover as well. I'm so looking forward to Arson! This looks good and the cover is so interesting! !